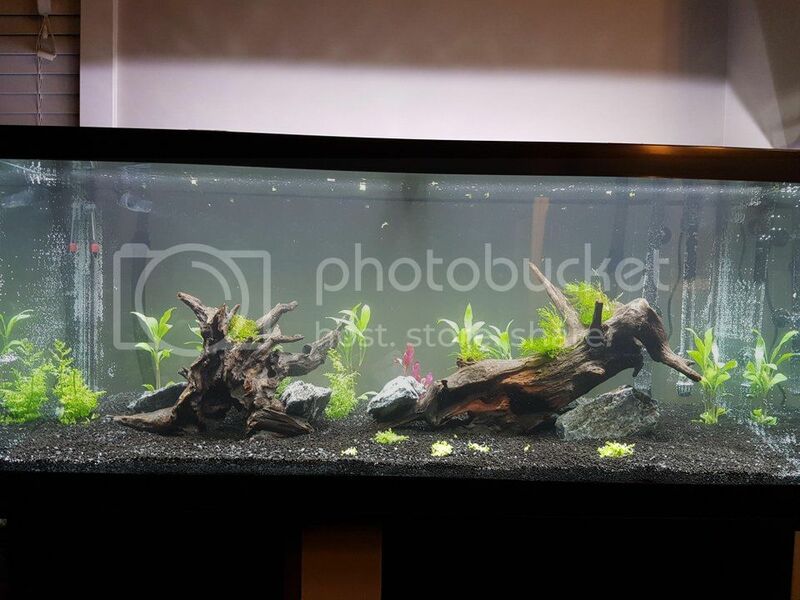 Not only am I new to this forum, I am also new to planted aquariums! 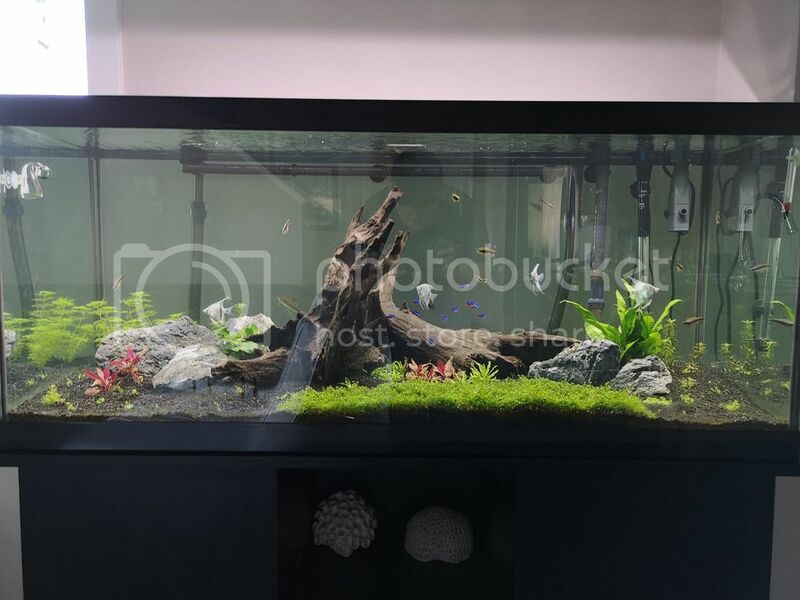 Back in November 2018, I decided to embark on a frustrating journey to own a planted tank which ended in disappointment. However, this early journey has not deterred me from trying again! In March I did a tank "reset" to try and get things right, and maybe even learn a thing or two about something. 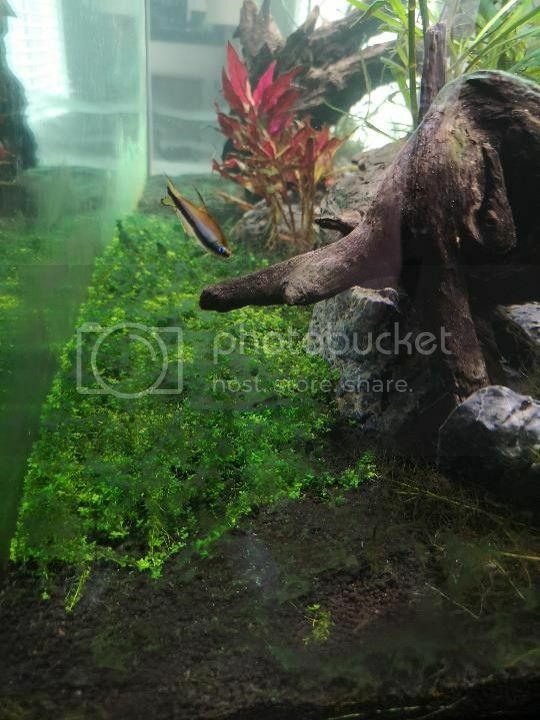 Before I get to where the tank is at now, I wanted to give an overview of my first attempt, with the sole purpose of identifying all the mistakes I made, resulting in an imminent failure. I also encourage you all to identify things I have missed. So here we go! November 7, 2018: Day one. 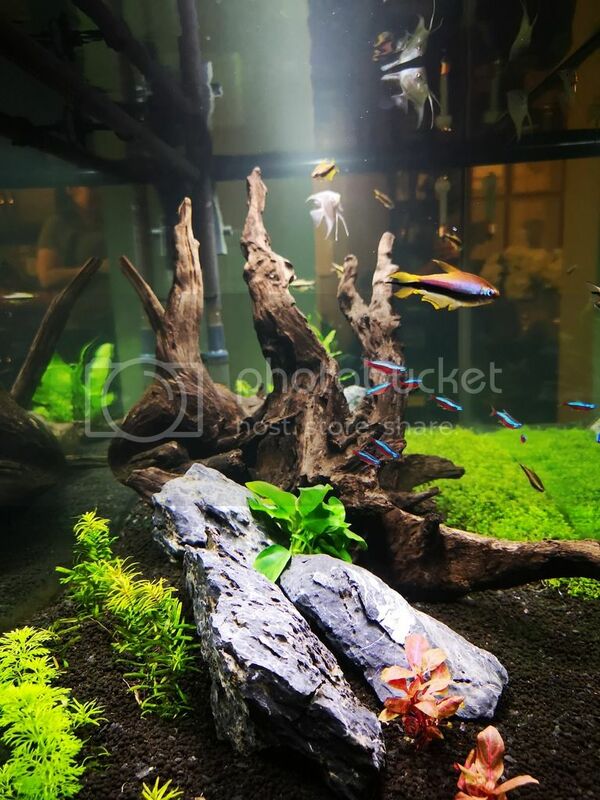 There is nothing more exciting than flooding your aquarium and planting! I believed I had everything I needed, as the soil was already enriched, and the LFS guy told me I shouldn't need to add any ferts for at least a year. HA! Anyway, things were looking very nice. And it didn't take long for things to take off. November 29, 2018: Things are growing quickly, but still looking healthy! 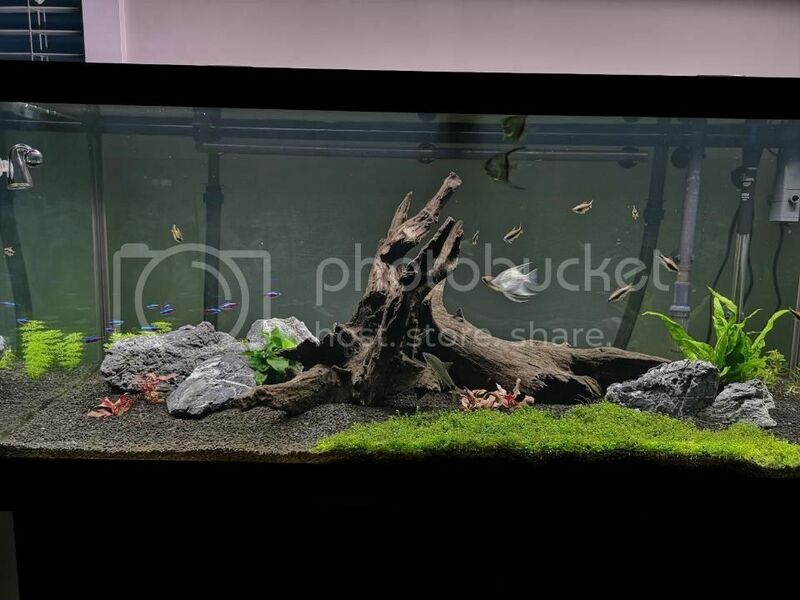 I decided to add 12 Cardinal Tetras to add some more colour to the tank. Water tests indicating a pH of 6.4 and still no nitrate. December 12, 2018: Oh boy....Things have really grown, but it's not so nice anymore. There's a thick, persistent layer of oil/slime on the surface of my water. I don't understand! The parameters show zero across the board! Things should be pristine in there! As you can see, I also added more fauna, 12 Emperor Tetras, just because....got to have fish, right?! February 28, 2019: It's just before this point that I realized, I've really messed up. I start scouring the web for solutions and root causes. Over the course of the month, two cardinal and one emperor have died, and I simply cannot keep up with the BGA that is now rampant in my tank. This image is 3 days after cleaning. I decide here to start from scratch. I take inventory of what fauna remain and am surprised to find a emperor fry. Apparently the sole survivor of it's kin. Bonus fish! Also, I've added more! 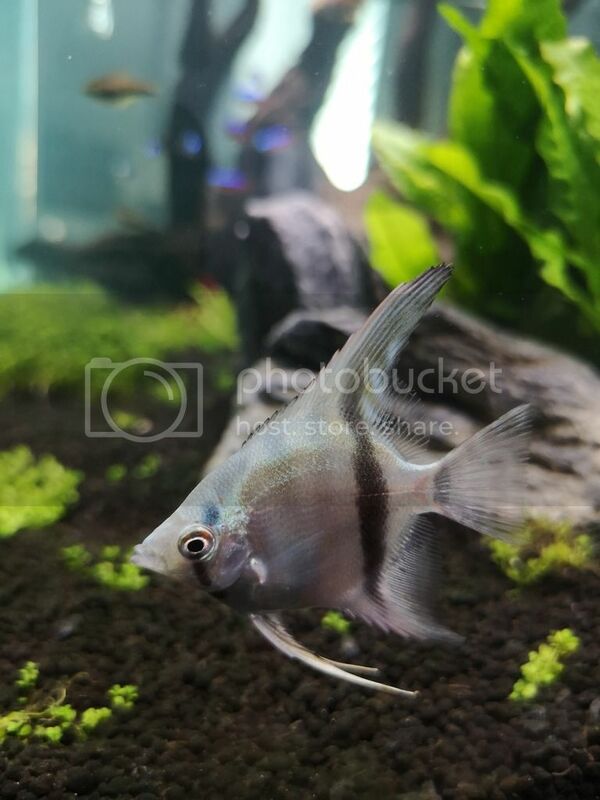 Four blue angelfish. March 4, 2019: Added some more flora. EI fertilizers have arrived in the mail, performed another 50% water change. I realize today is March 7th, but I will save the Fresh start for another journal entry. So what did I do wrong? -I was in a hurry. -I didn't have ferts. The plants outgrew what little nutrient was in the soil. -I didn't have good CO2 control. Between the iffy on-off times and the surface slime, things were all over the map. -I thought more light meant better results. Cue algae. -I thought my canister filter could go longer between cleans. -General upkeep was lacking. 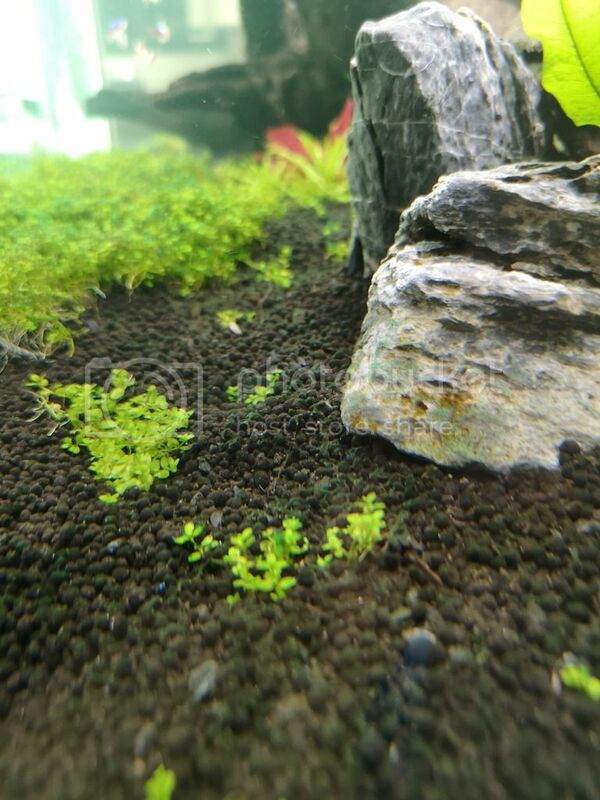 By simply not trimming the plants adequately, circulation was affected, making it easier for algae to take over. -I didn't understand the water parameters. And when the going got tough, I basically threw in the towel and stopped testing. I was running blind. -Did I mention I was in a hurry? 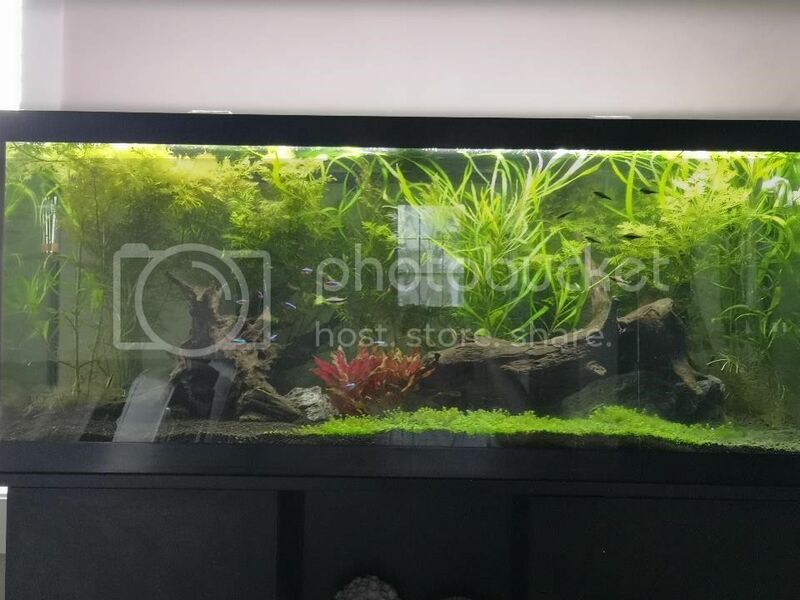 I wanted that gorgeous tank yesterday. This takes time. I'm still learning, but I think I'm way better off than I was four months ago. Let's make this a great comeback story, okay? Greggz, ipkiss, chayos00 and 5 others like this. CO2 is probably a little on the low side. Bumped up the regulator pressure to 10 psi today and targeted closer to 4 bubbles per second. I'm working at the moment, so I don't really get to monitor what the pH or drop checker are doing. It looks like BGA is making a comeback. I suspect lack of 02/circulation and too much light. Today I angled my spray bar toward the front of the tank for some good surface ripple and better circulation (it had been angled down the back previously) and light intensity has been reduced from 100% to 75%. Tested nitrate at 20ppm. Anyone have experience with these? The EM may require a prescription, but I've yet to contact my LFS to check availability. Greggz, chayos00 and KZB like this. 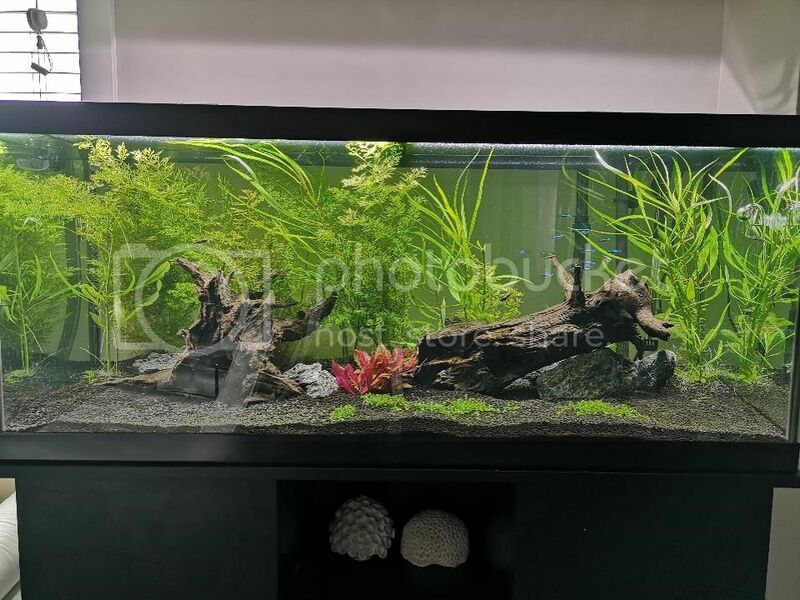 Hello @carlsj2002 your tank is looking good. For your Bga I used Ultralife Blue Green stain remover with great success before. Got it on Amazon. You look to be on a better track. Glad you didnt give up. I would suggest looking at some members journals here and see what their doing. Co2 at 4 bubbles per minute worries me, but I think you ment to say 4 bubbles per second. Pick up some test kits so you can share your water parameters and the members here at TPT will be able to help you. Keep up on your 50% weekly water changes, along with thorough gravel cleaning, proper filter maintenance. Keeping a tank and equipment clean goes a long way. Goodluck and enjoy the ride. This is also a useful link to help with fertalizers https://rotalabutterfly.com/nutrient-calculator.php. Greggz, Tannerleo and carlsj2012 like this. I currently have the API master test kit, but I think I will pick up a gH/kH and PO4 kit. I found the template @Greggz has been using, and like it a lot. I will play around with it a little bit until I figure out what I'm doing. The journals have been fun to read through, although they mostly make me want to get another tank! Greggz and KZB like this. Decided to do a spot vac of the BGA this afternoon when I woke up (working the night shift at the moment). I got a good chunk of it out, but I know it's still in there. I'm hoping the adjustments I made will prevent it from spreading. Ended up being ~10% WC. Didn't want to go too crazy before work! Dosed my regular macros, and doubled down on Excel at 10 ml. Going forward, I will spot treat with H2O2 until (hopefully) it is eliminated. I figure if it can no longer spread, then I will just sit there waiting to be eradicated....maybe I'm delusional. I'm beginning to wonder if something else is happening in my tank. I do see what resembles BGA on the substrate, but the didiplis appears to be getting a coat of lighter green colour on it. I thought BGA didn't "jump" up onto plants, more of a creep up? Also the rosanervig leaves are getting a dusting of brown on them. Diatoms? I'll try to get some pictures when I'm not working. On another note, I've been working on filling out my water parameters spreadsheet. I've got most of it done now, but I'm waiting on a degassed pH value. I'll be using the API pH test kit for those values. I know they aren't as accurate, but it's all I've got for now. Tomorrow is WC day, so I'm curious to see what my NO3 readings are pre and post WC. I'll have to pick up some other test kits for PO4 and gH/kH. I also have some concerns with regard to my PAR value. 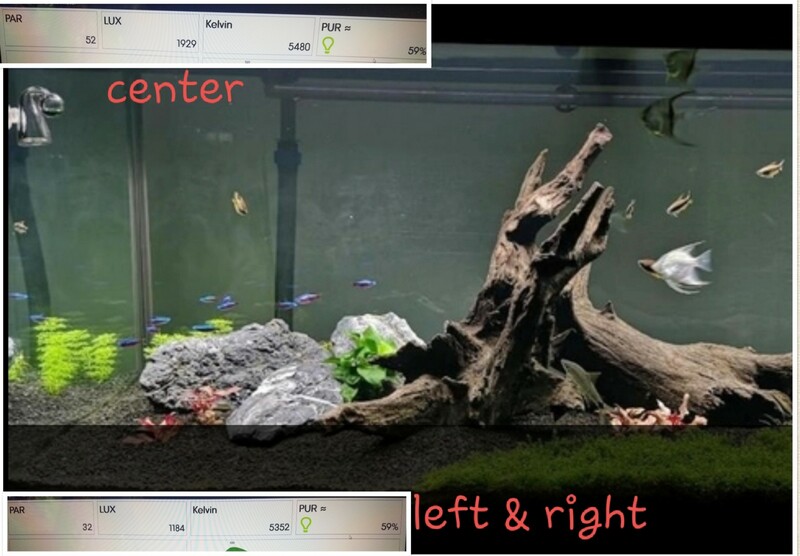 Based on the PAR data I managed to find, I suspect I am getting just under 50 PAR at the center of my tank. I feel like this isn't enough light? So I was sitting there pondering about my water clarity. I don't think I mentioned this yet, but the water is not as clear as I would like it to be. Then it hit me: I think I've got my filter set up all wrong! Not only that, but it really isn't set up to be polishing water at all!!! I have no fine polishing, only coarse sponge. And to make things worse, I think my trays are in backwards. Bio media is in the bottom, I have some carbon in the middle tray at the moment, and a coarse sponge on top. Guess I'll be doing a filter clean tomorrow! I'll stop at some shop somewhere and pick up some polyester fill. No wonder I'm running into so many issues! I would suggest losing the carbon completely. It does not really help with clarity. I only use carbon if I want to clean out meds. Most canisters run bottom up on chambers. Mine have 4 chambers. Coarse foam on bottom, two chambers of bio-media, then a medium foam and polish pad in the top chamber. Thanks @AguaScape! Yeah, that carbon was put in recently during my re-start to help with odor. All that BGA smell was not pleasant in the living room! I will probably leave it in there until the following filter change, as it's relatively new. I was wondering about the placement of the polishing stage. Would having it before the bio-media be beneficial in keeping them a little cleaner? I had noticed there wasn't much in the coarse foam last time I took it apart. Carbon will help with odor, but odor is usually not caused by algae so much as detritus. Algae is often the result of too much detritus as well. Proper cleaning and filtration will help with that. I prefer to put the polish pad as the last step. This may just be personal preference, but it works for me. I find that most the mulm will collect in the coarse foam and the fine stuff will flow through the bio media to get caught later in the medium foam and polish pad. The polish pad is more prone to clogging due to how fine it is and having it on top allows me to change it easily if I notice a flow reduction. Tomorrow I hope to determine my pH drop, as well as see where my nitrates are at after the WC. As per KZB's recommendation, I increased the RGB light to 100%, leaving the white at 75%. I did not realize just how low on the red spectrum the Satellite +Pro was. March 12, followed up with some water tests. Low pH at the end of the day was 7.0, NO3 after the water change is sitting at ~30ppm. Still no tests for PO4 or K, but with NO3 being in range I'm just assuming the others are as well, so I decided to skip my macro dosing today. Looks like I can also increase my CO2 injection, so I'll work on fine tuning that. Greggz, ChrisX and KZB like this. Just hunting for some new threads to follow and yours caught my eye! 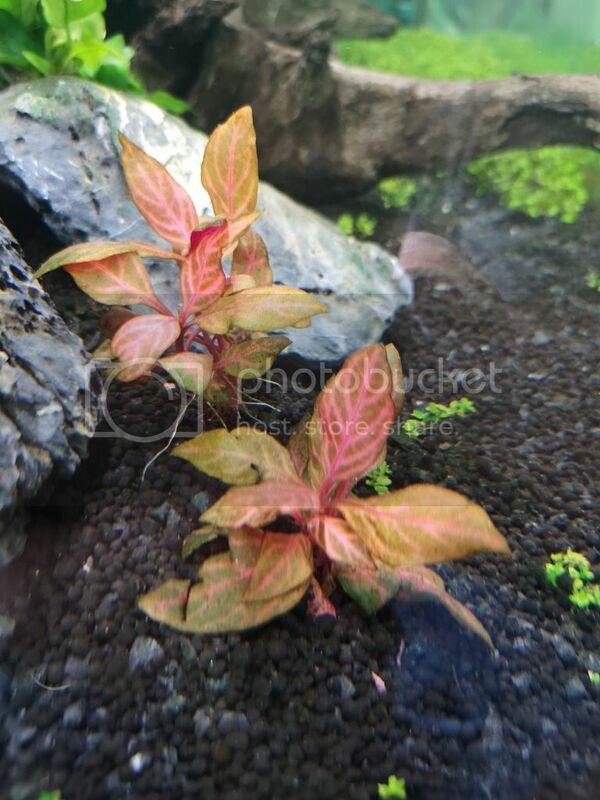 Growing pains seem to be the trick of the game to figuring out how to keep a great looking tank it seems! You've got a great looking tank and I can't wait to see where it grows from here! Also that Emperor tetra picture in the 5th picture two posts up sure caught my eye. 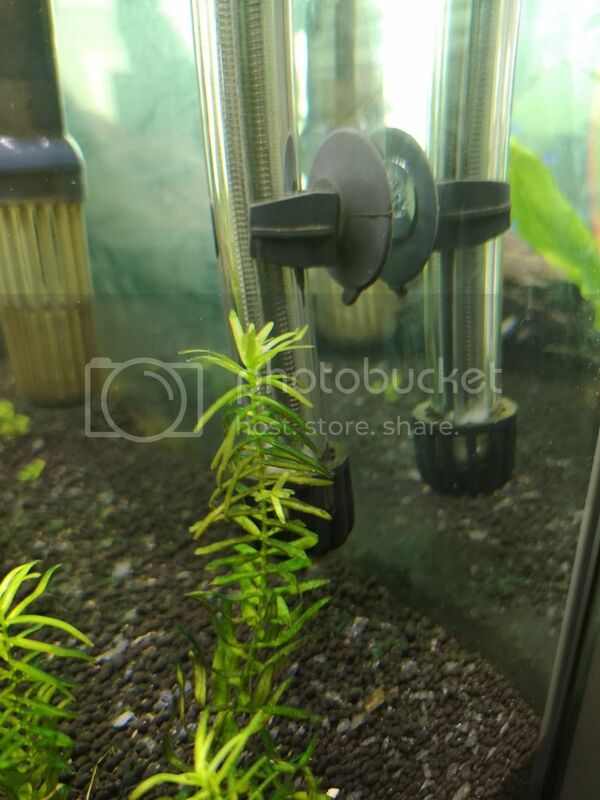 Makes me really want to get a dozen of them for my 125g tetra filled tank!